at the Palmer Station in Antarctica. TAMPA, Fla. -- In the crowded aisles of the laboratory, chemistry graduate student Alan Maschek pointed out a beaker under a chemical hood. A dark, oily substance clung to the bottom of the glass like day-old coffee in a cup. What looked like neglected grime to an outsider is really the basis for the research Maschek and others are working on. The University of South Florida's Department of Chemistry is currently performing research on marine invertebrates in Antarctica. This particular substance was an algae extract. Professor Bill Baker leads the research team, composed of graduate and undergraduate students, as well as professionals in the field, to study metabolites produced by organisms on the continent. These metabolites generally serve as defense mechanisms to protect the organism from predation and infection. Earlier this year, Maschek and Baker, among other students and researchers, journeyed to Antarctica, a four to five day boat trip from Chile, to spend four months in freezing temperatures to collect specimens and perform experiments at Palmer Station, Antarctica. The group collected specimens during dives in below freezing Arctic waters and tested extracted compounds for anti-cancer properties. Maschek said the work is also an opportunity to learn more about Antarctica’s largely unexplored benthic sea-life and ecosystem. “That area of Antarctica is unique because it’s dominated underwater by algae and sea weeds, and what kind of controls the growth are these little insects called Anphipods,” Maschek said. Mascheck said this allows researchers to get a glimpse into the past and see how life may have evolved in certain places. He said the goal is also to lay down the groundwork for pharmaceutical companies to develop practical applications for the work. “We’re trying to develop leads, not drugs,” Maschek said. “That’s what universities are doing. Then Big Pharma and other companies can begin taking it over.” Maschek was reserved in tone but clearly excited about his work. He maneuvered his way around the laboratory with familiarity and comfort. He said he spends between 40 and 80 hours a week there. Chemistry jargon rolled off Maschek’s tongue as easily as his own name. He meandered through the narrow aisles of the lab, pausing occasionally to explain the function of important machinery and introduce other students involved in the research in Antarctica. 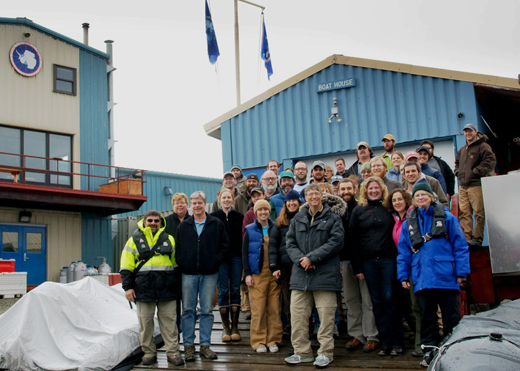 While Maschek was in Antarctica last semester, philanthropist and Microsoft co-founder Bill Gates stopped by the Palmer Station. His family was visiting in celebration of his son’s 10th birthday, what some may consider an odd venture for a younger child. But Maschek quickly pointed out the sightseeing one could do by boat. “There’s a ton of wildlife to see - whales in the water and penguin colonies,” Maschek said. Inside the station, Mascheck showed Gates the sorting table where they prepare their marine invertebrates for storage. Some of the specimens were of interest for the Medicines for Malaria Venture, an organization supported by the Bill and Melinda Gates Foundation. Maschek laughed when recalling a particular incident. “They did have to reboot Windows to show him the presentation about our research,” Maschek said. After the tour of the lab, Maschek refused to be photographed by himself and insisted on rallying his lab partners, most of whom had also visited Antarctica or worked on developing extracts from the specimens that were collected. The work evolves every year, dependant on changes to the grant and new discoveries, Maschek said. Specimens collected during the most recent visit to Antarctica will be studied by Baker’s students for years to come.